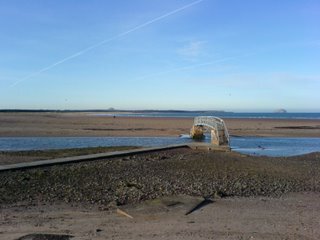 Yesterday I took a 70 mile cycle along the East Coast from Edinburgh via Musselburgh, North Berwick, and Dunbar. It was a really nice day for cycling as there was only a gentle breeze and a nice spring sun, whilst not being too hot like in the middle of the summer. I can now say that I have cycled the whole way along the East Lothian Coastal Trail, and across the Scotland-England Border. Between Port Seton and Gullane there was a very high number of cyclists travelling in the opposite direction. Many of them were bunched up in groups. Most were wearing proper lightweight cycling gear and using road racers, unlike me. At North Berwick I didn’t stop this time, I just kept going. 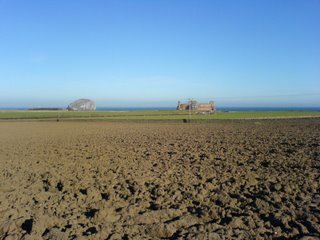 Shortly after, just outside Tantallon Castle, I stopped for a quick drink and take my fleece of since it was getting rather warm. Until North Berwick the road was fairly busy in comparison to the rest of the journey where the roads were a lot quieter. This was probably just as well after Dunbar as many of the vehicles beside you can be travelling at speeds of 60 or 70 miles per hour. There are some parts of the journey that had sections specifically for cyclists, which was nice. It would however have been better if there were more of them. At Dunbar I took a short break for lunch and set on my way again. It was about 1pm, so I had another 3 or 4 hours to cycle the next nearly 30 miles to Berwick (the next station on the East Coast Mainline). I headed into the unknown. At one point I decided to deviate of the A1 to go along some of the back roads, and ended up in some bay with a single track road and at the bottom was a caravan park. Heading back up the other side was so steep I had to get off and push the bike up the hill. Next time I’ll either keep to the roads I know, or take a map with me. 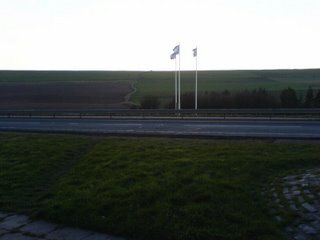 I managed to surprise myself as I thought that it would be dark even before I got to the English border. 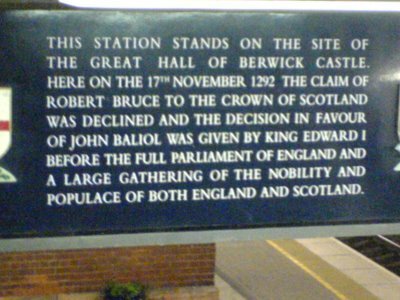 Even so the sun had already set, it was still light enough until I got into Berwick upon Tweed. The train back home cost me £10.10 with my young person railcard. It seems that once you are going a larger distance, it doesn’t matter which of the Edinburgh stations that you go to, even if you have to change trains, it still costs the same, which is nice. This entry was posted in Cycling on February 4, 2007 by smsm1986. Nice pictures and that is one long and tough ride. I thought that most of the Scottish/English coast was flat. This ride proves me wrong.